Peter Parker used the Iron Spiderman costume initially during Civil War. Winter Soldier was Bucky back from the dead, prior to rejoining the good guys and becoming the New Captain America. UPDATE: Fxfranz has a third video review of the Skrull Soldier, also part of same assortment. Skrull soldiers form the bulk of the Skrull army and have been a long-time staple in the ranks of Marvel villains. They were also featured quite heavily in the Civil War sequel, Secret Invasion. Both are already on my list, but given the choice, I'd get ISM first. 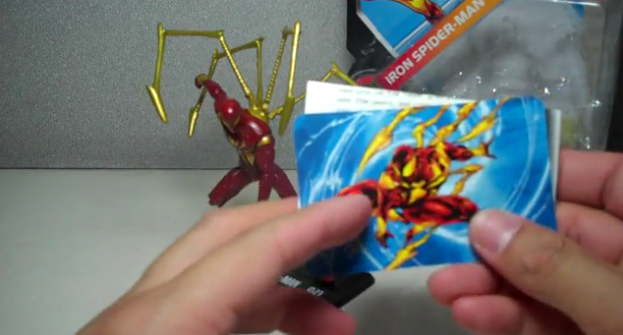 Love that Iron Spider Man. 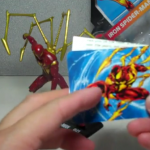 Of ALL the Spider-Man figures they bring out, why in the hell do they always put the most effort into the Iron Spider mold? My Skrull Soldier's stand doesn't have "Skrull Soldier"
Instead it has Skrull language on it which is clearly indecphierable to me but I can only imagine that translated it says "Skrull Soldier"
Any body else get this? I like this guy's reviews. If anything, I would suggest better background and lighting (i.e. like a single color dark fabric) and some day lights. Also, more comparisons with existing figures. Mine too. Pretty f'ing cool though, no? Easy pass for me on this wave. Good thing too, considering how much money I'm going to spend on Pursuit of Cobra figures in the next month. Damn I didn't know there was a new Iron Spidey coming out. I must have that. Now make a Marvel U 2099 Spidey!